A gephi visualization of networks defined by the Modernist journal the New Freewoman. Although the graph is largely unreadable here (it is meant to be interactive and this is a still frame), some famous names (like Ezra Pound) are visible. Green, red, and blue lines connect dogs of various sizes, each one representing a person. The more the person has published the larger their dot. 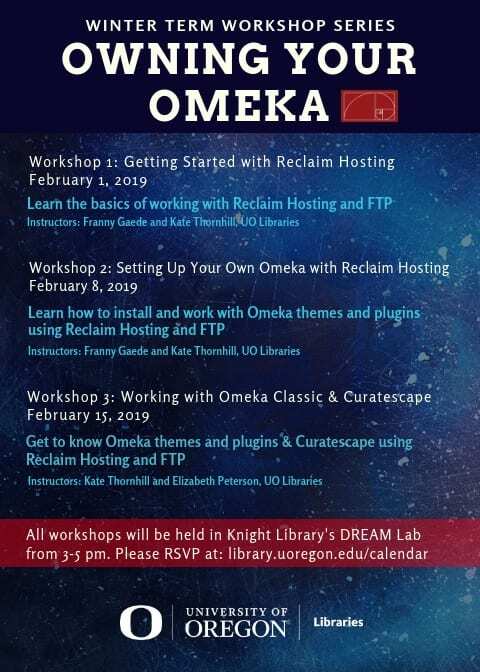 We would also like to draw your attention to the winter term workshop series, “Owning Your Omeka” a three-part sequence designed to help you create an Omeka website from start to finish. Omeka is a publishing platform used commonly among academics, museum professionals, and libraries. Omeka allows us to conceptualize and build multimedia exhibits without having to learn coding languages. The first workshop is running this afternoon, and there are still spots available (RSVP here: https://library.uoregon.edu/calendar). The workshops are free and open to all. We hope you will join us! About: “We invite applications for a fully-funded ESRC 1+3 Case studentship available in Digital Humanities. The student will be supervised by Prof. Ian Gregory (Lancaster University) and Dr. Joanna Taylor (University of Manchester) with support from Dr. Mia Ridge from the British Library’s (BL’s) Digital Research Team. This exciting project will involve using text mining techniques such as corpus linguistics, along with spatial humanities approaches, to study the 19th century British soundscape using the British Library’s digitised text and sound archives. The student will be someone with a good first degree in Literary Studies, History, Human Geography or similar. An interest in 19th century environmental history and/or Digital Humanities would be an advantage, however full training will be provided. The studentship is offered on a 1+3 basis allowing the student to learn all of the required digital skills by taking Lancaster’s new MA in Digital Humanities ([www.lancaster.ac.uk/history/masters/ma-digital-humanities]www.lancaster.ac.uk/history/masters/ma-digital-humanities) in the first year, before proceeding to the PhD in the following three years. Additional training will be offered in collaboration with the British Library. This is a CASE award whose ESRC funding will cover full UK fees and a tax-free stipend, currently £14,777p.a. (in 2018/19). Part-time applications are welcome. About: “Proposals are now being accepted for presentations at the DHSI Conference & Colloquium, to be held in June 2019 alongside classes at the Digital Humanities Summer Institute, University of Victoria. Open to all, the DHSI Conference & Colloquium offers an opportunity to present research and projects within an engaging, collegial atmosphere. Participation comes free with DHSI registration, and contributors not planning to register for a DHSI course can join for a modest participation fee of $150 CDN. About: “The editors of H-Grad are excited to announce several openings on the editorial board. About: “We invite submissions for 15-minute presentations from UO graduate students on any aspect of Data/Media/Digital studies for a one-day symposium on Friday, April 5, 2019 to be held in the Knight Library’s new DREAM Lab collaborative workspace. Presentations can be based on work in progress or on research and work in the final stages of development. Proposals should specify clear scholarly or pedagogical goals, and should articulate how the design or argument of a data/media/digital project might address those goals. This event will give us an opportunity to showcase exciting multi-disciplinary work being produced by graduate students across campus. Any kind of data, media, or digital studies project is welcome. Participants are expected to attend the Symposium for the full day. Lunch will be served for presenters.